During my time at the Australian Institute of Marine Science (AIMS) I studied the effects of macroalge mats on understory corals in the Great Barrier Reef. 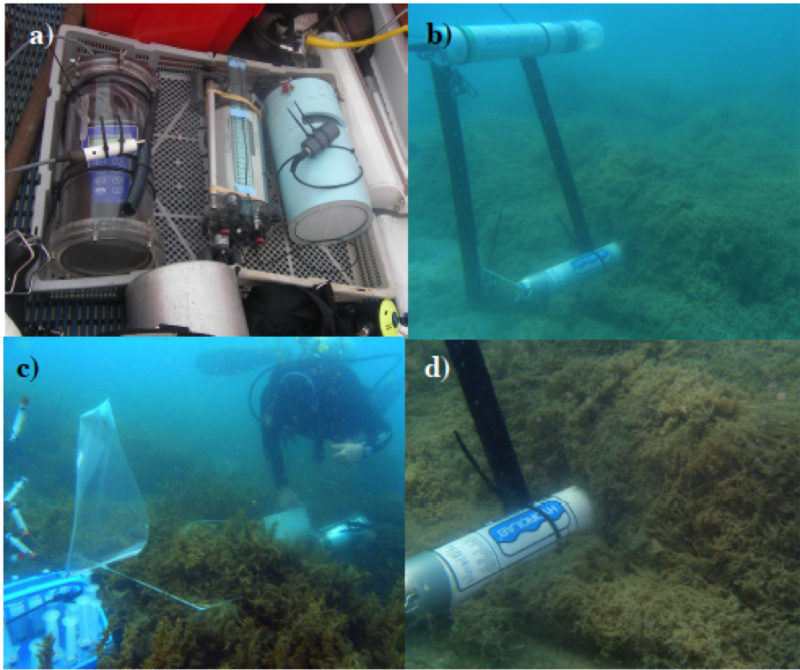 I measured pH, dissolved oxygen, alkalinity, dissolved inorganic and organic carbon, silicic acid, phosphorous and irradiance underneath and above macroalgae assemblages to quantify the influence of macroalge on the microenvironment of understorey corals. 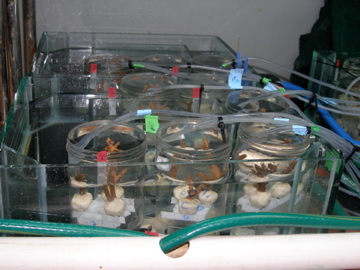 With controlled aquarium experiments and RNA/DNA analysis of coral nubbins exposed to different concentrations of macroalgae incubated water I tested the response of corals to conditions found underneath macroalgae assemblages. This study was published in PLoS ONE and is available here: doi:10.1371/journal.pone.0012685. 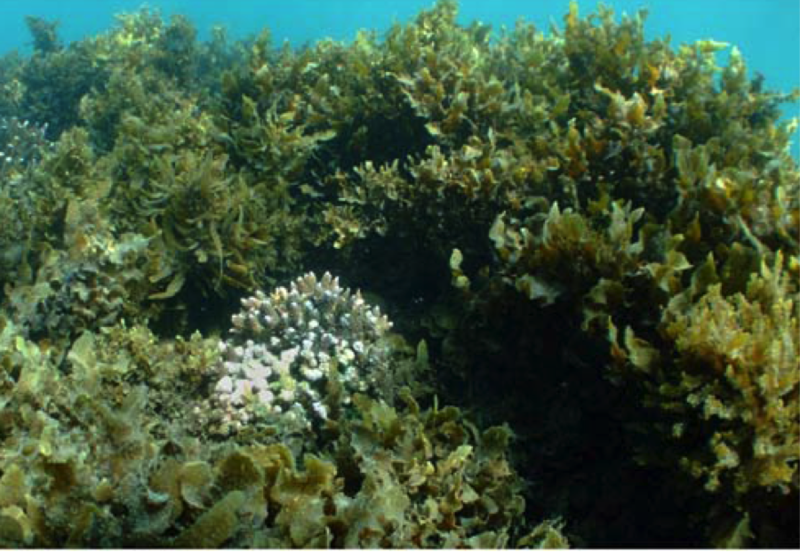 Canopy-forming macroalgae assemblage, dominated by Sargassum sp., Dunk Island, Great Barrier Reef. Scuba diving fieldwork: a) Hand-held pH meter (a true old-timer today! ), fluometry (PAM), and dissolved oxygen (DO) meter, b) installed Hydrolabs (pH, DO, salinity and temperature), c) diver measuring pH and DO, and taking water samples in a quadrate dominated by the macroalgae Sargassum sp., d) close up of Hydrolab installed underneath H. clathratus mat. 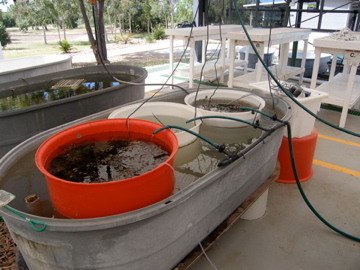 Mesocosm experiment: Corals were exposed to different treatments such as macroalgae mats, artificial shading, macroalgae incubated water, and regular seawater. Aquarium experiment: Coral nubbins were exposed to different concentrations of water preincubated with macroalgae and levels of irradiance.